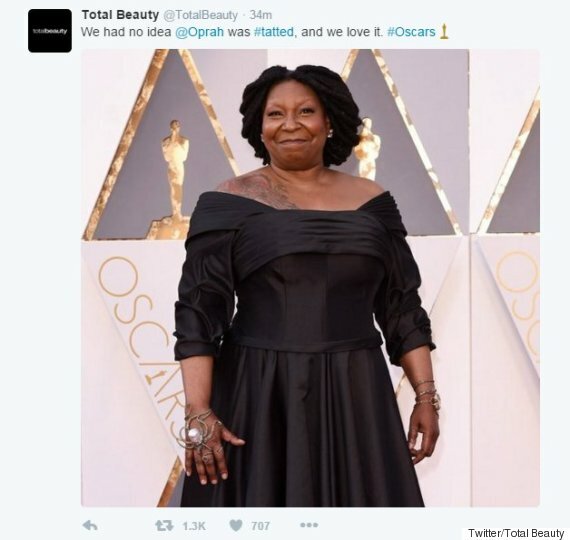 Total Beauty is feeling the #OscarsSoWhite heat for a careless red-carpet tweet. The L.A.-based business made itself a target for mockery after it tweeted a photo Sunday night of Whoopi Goldberg at the 2016 Oscars that mistook her for Oprah Winfrey. UPDATE: 11:15 p.m. ET -- Total Beauty apologized for the tweet. The initial tweet was deleted. But the resulting reaction was not. The tweet came amid the current Oscars controversy that arose when not a single person of colour was nominated for an acting award. Criticism has spread widely in the form of the #OscarsSoWhite hashtag, and the Academy of Motion Picture Arts and Sciences has responded by making changes to its membership policies. If people can't tell Whoopi Goldberg and Oprah apart, it's clear there's a major problem.